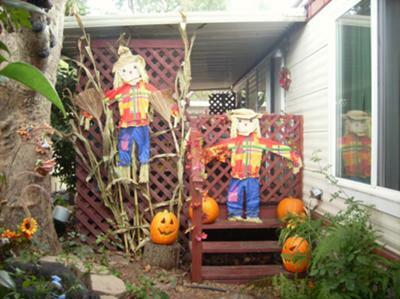 Autumn Porch Decorating Contest 2009: This was our very first autumn contest and it was well received! 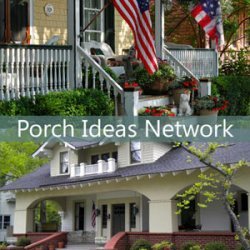 We're so delighted with all the entries we received - autumn porches from Michigan to Texas and from Pennsylvania to California. 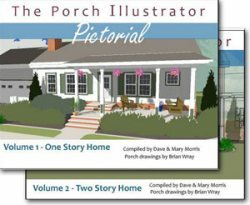 Thank you, all, for sharing your porch pictures and stories with us. You are wonderful! 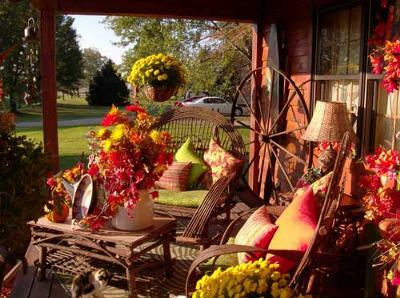 We love our big farmer's porch and try to make it as inviting and cozy as we can. 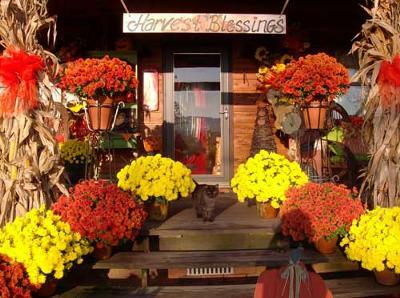 We have plenty of mums and earthy decorations such as pumpkins, gourds, and all kinds of squashes. The pumpkin lanterns and black cat add just enough whimsy to get us into the Halloween spirit! "Our Country Home in the Fall"
Most of the things we have been collecting for the 33 years we have been married, but each year, but buy new mums, we keep our money all year long in our MUM jar. My son, husband and I enjoy decorating for the seasons. We tried something new this year by adding cabinets on the porch, and our old spinning wheel, we're just plain old country people want want our home to have that feel. We want people to drive by our home and realize that there is a lot of love here. We have never had a lot of money to decorate, so for the 33 years we have been married, we've collected decorations for each season, year after year, and all we add to the collection, are the fresh flowers, in the fall, it's mums. We have a "mum" jar, and we pitch our extra change in it each year, so that's how we come up with the money to get them, and never miss it. Experiencing autumn in Central Pennsylvania is a true treat! Pumpkin patches, apple orchards, corn mazes, and hay bales abound. I was inspired by the sheer beauty of our surrounding country-side and wanted to bring it home with me to the city. I painted the numbers on the pumpkins using a stencil and arranged the rest of my elements in a manner that celebrated all-things-fall. A collection of handmade, vintage and natural seasonal elements welcoming visitors to our home. 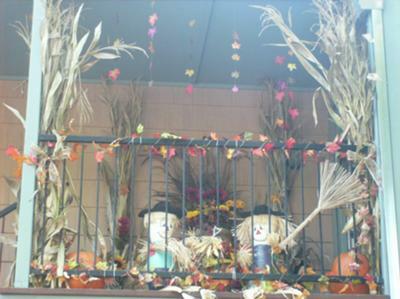 Every year I dress up our teeny porch with corn stalks, mums in planters and pumpkins. Even though it's small, it makes a big statement! 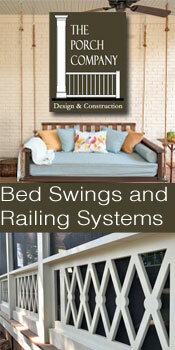 We changed the summer look of reds and sage greens to orange and gold. White rockers were switched to brown rattan chairs and ottomans. 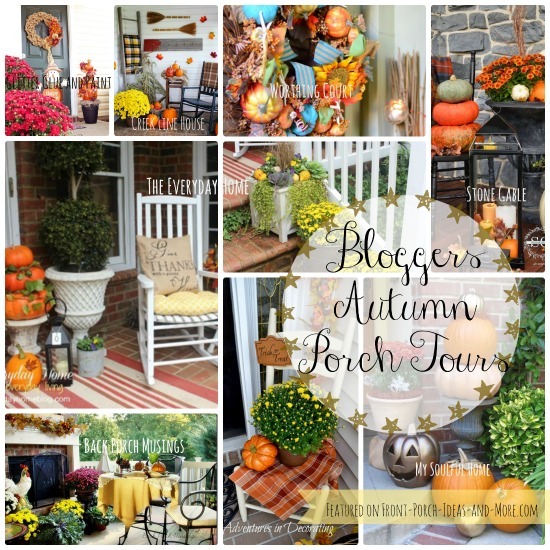 Comfy pillows with Fall inspired colors and patterns fill the chairs. Inviting lamps offer a welcoming glow. The perfect spot for coffee and homemade pumpkin bread! 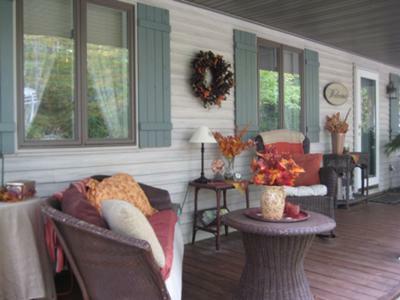 This is one side of the front porch...a palette of all colors greet visitors to our home. 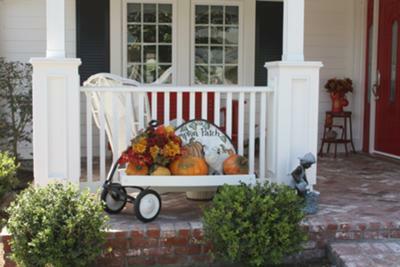 I spent a few hours preparing some of my front porch items that needed refreshing. I painted flower pots black, sewed fall pillows for the rockers, and planted, planted, planted. 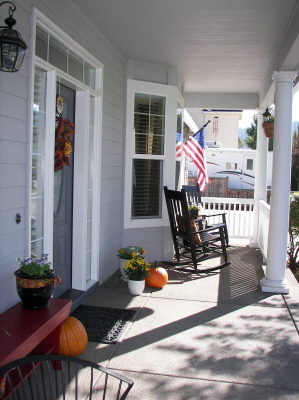 It's beautiful this time of year in Oregon and I'm delighted to share my porch with you. 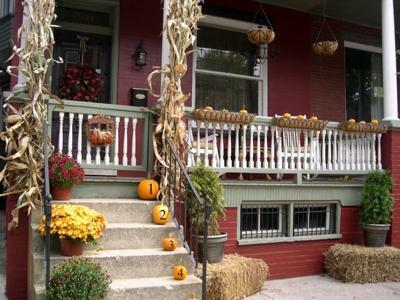 I spruced up my pots with spray paint and planted lots of flowers, added my pumpkins and wreath, and let the best decor, the sun, shine on my front porch. It's beautiful this time of year in Oregon. All Dressed Up For Halloween! Every year my kids and I do a craft for Halloween that we can use as decor. 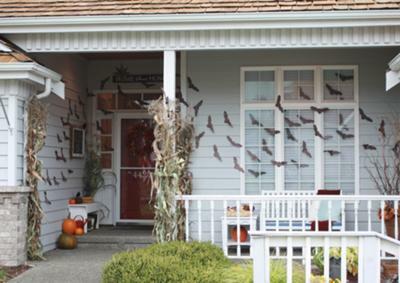 This year, we chose to make bats that would be hung all over our front porch. The look makes a statement and kids (young and old) seem to love it! With the bats "flying" around, pumpkins sprinkled on the ground, cornstalks standing in their places, and a few crows added in for good measure, it can only mean one thing...we're ready for Halloween! 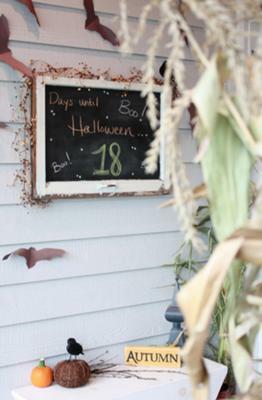 Our Countdown To Halloween Chalkboard! I like to decorate for fall with just a touch of Halloween. 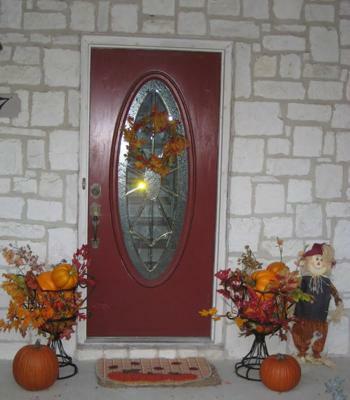 We live in an area where there are no trick or treaters so I try to make the porch welcoming for people driving by. 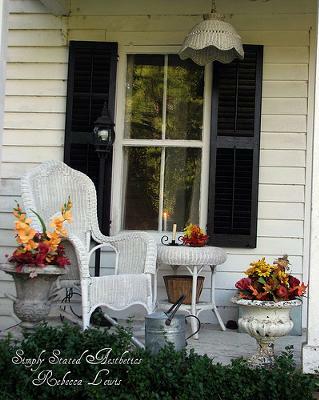 On warmer fall days I enjoy sitting out there enjoying the fall colors. Fall is one of the nicest times in Michigan and there isn't a better spot to enjoy it. My front porch looks out over a large wooded area. The maple and oak trees put on quite a show. 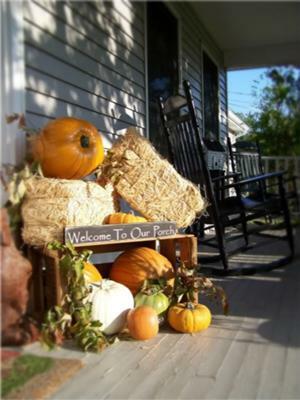 Autumn time at our Farmhouse is bustling with activities and decorating our entryway with some old fashioned country goodness is a welcoming way to start the season! 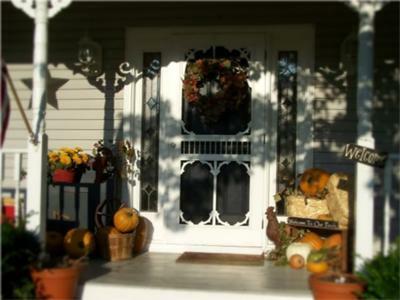 A handmade wreath hung on the screen door and a pile of pumpkins overflowing from an old farm crate says come on up folks and sit a spell! I love my porch. 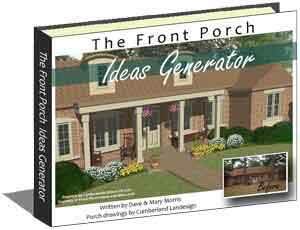 You don't see many porches in Southern Calif. 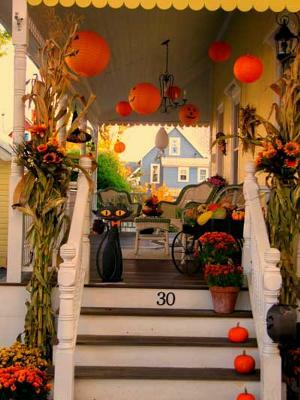 So Fall is an especially fun time of year to decorate. You can do so much with these stacking clay pots. 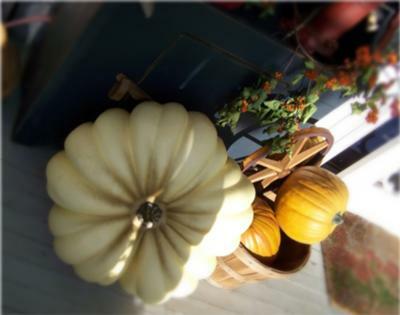 This antique orange enamel pitcher, was perfect for my Pumpkin Porch after I painted a pumpkin on it. 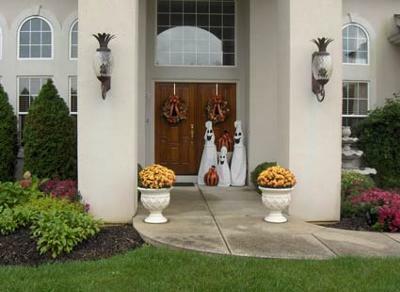 For three years now I have added the ghosts to the decor of the front entry to our home. 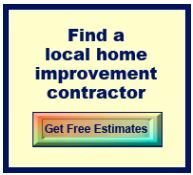 They are made out of sheet material with black felt. You can do any combination of large or small ghosts and they are slipped over tomato cages. 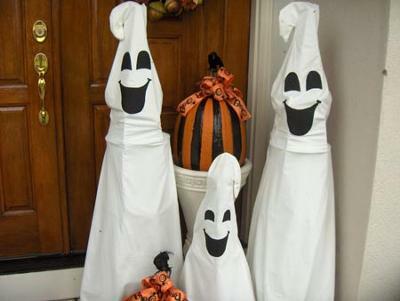 This is always a big hit with my neighbors when I start decorating for fall and Halloween. I have a timer on the outside plug to turn the lights on at dark and shut off at midnight. The lights are just Christmas lights wrapped around the cages. 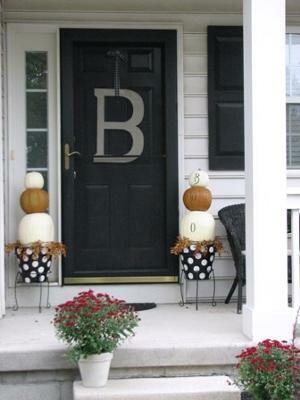 The pumpkins are taped and striped with black paint. I did this combination due to the "Bengals NFL" and to tie in the ribbon color on the wreaths. The pumpkins house black crows on the stems. 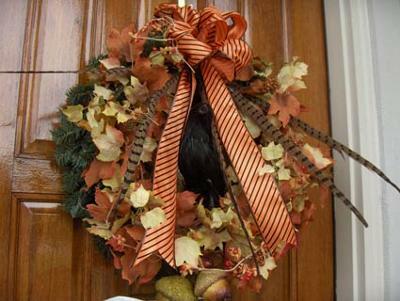 The wreaths are greenery underneath, attached are the fall leaves and orange and black stripped ribbon. I inserted feathers in the wreath also. 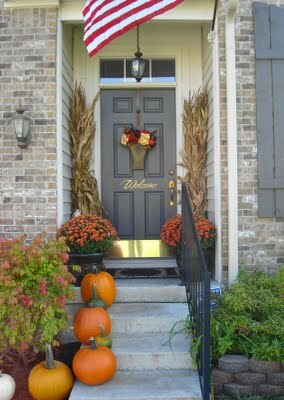 The wreath on the right side of the door has an owl perched in the middle of the wreath; the left wreath has a large crow. Mums in the large urns are different colors every year. This year I chose a yellow golden color to give it a pop of color. 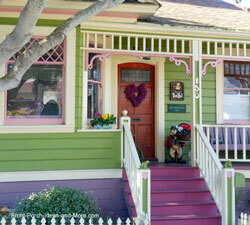 I live in a quaint home once lived in by my Grandma Rhoda. Come sit a spell. 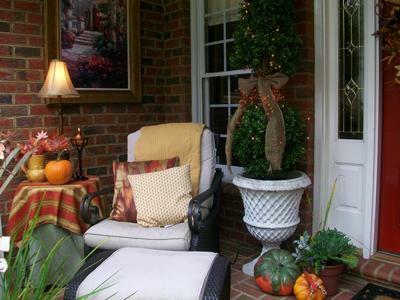 The porch I have decorated with the warmth and glow of autumn feel and upon entering my only wish is that it will make you want to sit, have a cup of tea or coffee and enjoy a relaxing moment. 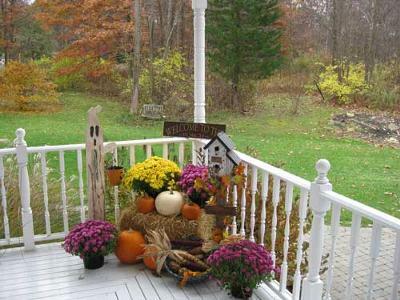 I love fall and all it brings and just hope my porch brings a welcome smile to those that approach it. 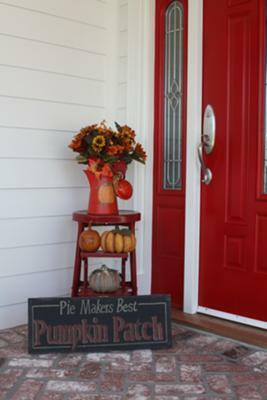 I have utilized a vintage quilt to attire my Grandma's red porch swing, lots of vintage furniture decorated with the colors of fall and many pumpkins and guards a trademark that fall has arrived. 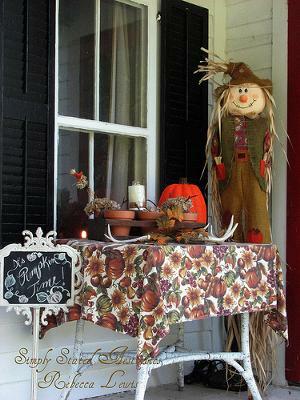 More of my quaint front porch.....I love anything vintage and using a vintage gate, old porch decorations, a milk container and watering can I have attired it all in fall decor incorporating the vintage feel with the autumn warmth and feel. 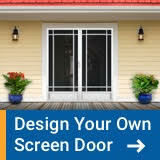 I want one to feel welcoming upon entering my home. 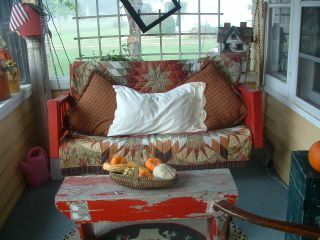 More of my quaint front porch.....I love anything vintage I want one to feel welcoming upon entering my home. 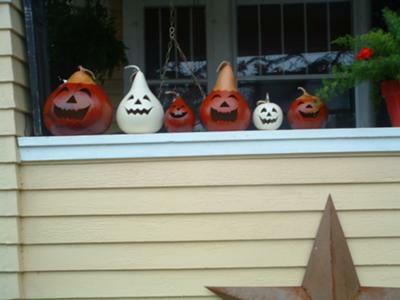 My gourds will bring a smile to your face and remind you that fall is in the air upon passers by. 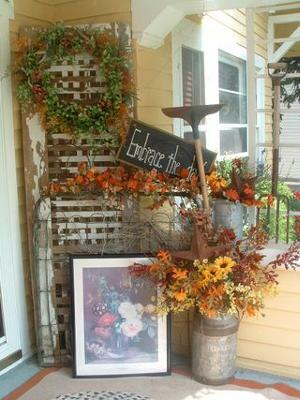 I started with wire urns and filled them with lots of pumpkins and fall flora. 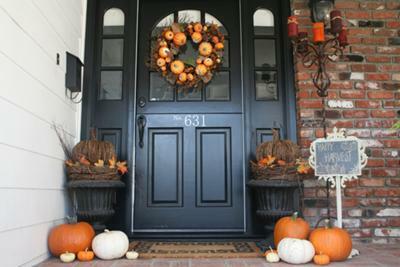 I added the wreath, more pumpkins,scarecrow and welcome mat. 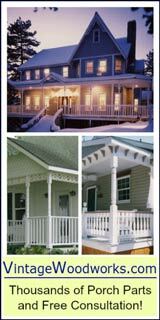 Our porch is a beautiful wrap around porch providing perfect "Nooks" to decorate. My husband and I enjoy going to our local markets to find all of the fall goodies. When we come home we mix and match to create something in every "Nook" then we just warm up the cider sit back and enjoy. 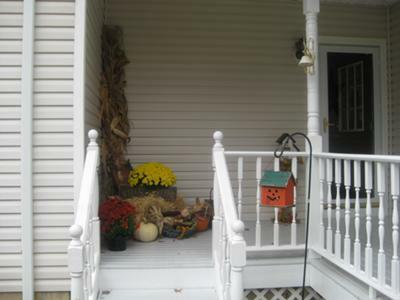 The photo that has the ghost in it is across from our rocking chairs and looks out onto our front yard. 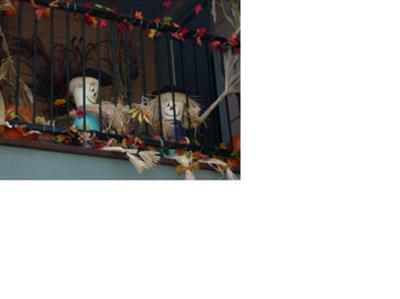 The 2nd photo with the pumpkin birdhouse, welcomes our friends from the side porch. Small apartment porch. I love to do crafts and decorate. 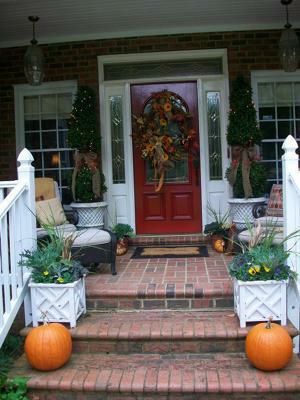 The wreaths are greenery underneath, attached are the fall leaves and orange and black stripped ribbon. I inserted feathers in the wreath also. 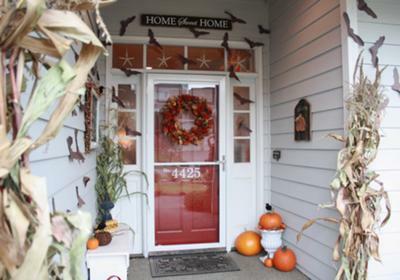 The wreath on the right side of the door has an owl perched in the middle of the wreath; the left wreath has a large crow. 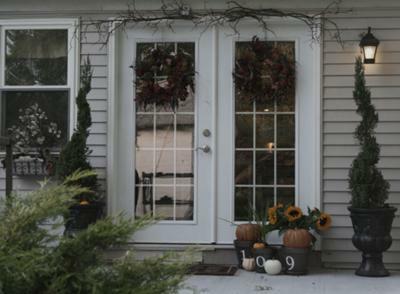 The wreath is just part of my autumn porch decor. You can see the rest of my porch in "Just a Few Friendly Ghosts". It started with the wreath, and then the urns. I had to do something fun with them and I love pumpkins, so I picked these, any kind will do! And I love to greet my family and friends with a special message on my chalkboard. Hi! 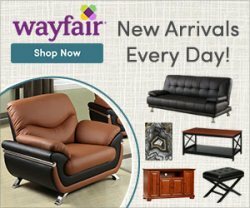 I'm Roeshel from The DIY Show Off, a blog where I showcase my DIY projects. I decorated my back patio (believe it or not we don't have a front door...but that's a long story) using natural treasures I discovered around our yard. Branches became swags for the French doors. 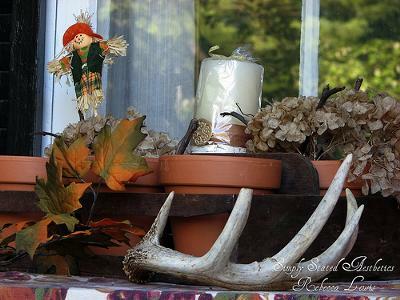 Window boxes are decorated using leaves, birch bark, pinecones, grapes, silver dollar plants and acorns for filler. I think they turned about more beautiful that anything I could have put together from the store. What do you think? You can see more photos and details in my blog. I made pumpkin topiaries with hot glue and artificial pumpkins from the craft store. 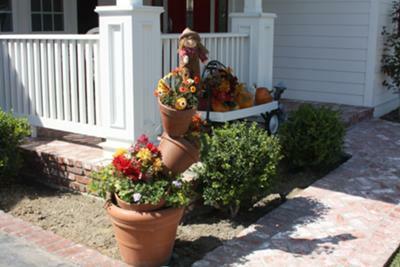 They are stacked on hand painted terra cotta pots with a leafy garland accent. 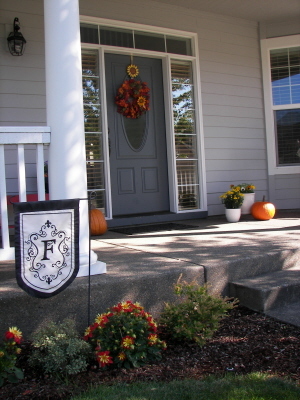 My signature monogrammed front door has been repainted for the season. 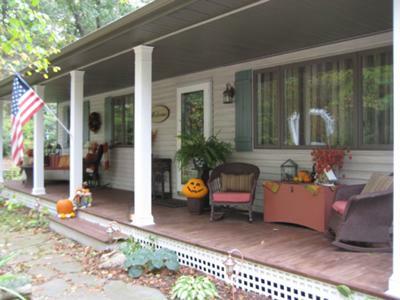 This is the porch I brought my first born son home to last fall. I will always associate this scene with that special day in our family's life. I love fall colors and I was inspired by your site so I decided to decorate just a little. 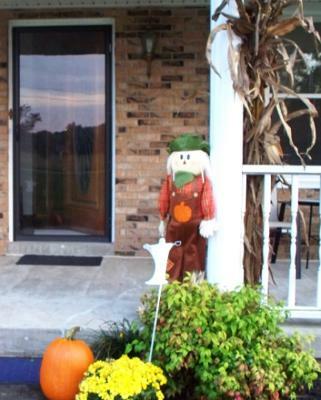 We have a scarecrow, a corn husk, a pumpkin and some mums. Danny put a ghost in there for the trick or treaters. 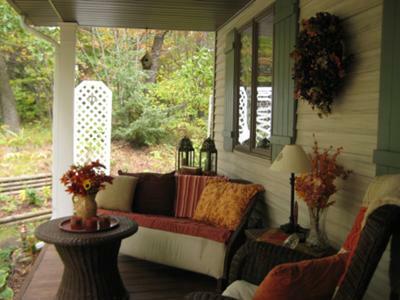 We have over twenty fall porches for you to enjoy. All of them bloggers and so very fun and inspiring!